Back in September of 2008 I was looking thru some photos of shortlines and found the Aberdeen, Carolina and Western. After much help from the members of STEP Inc and a lot of sleepless nights we came up with this 18×18 map of south-central North Carolina. This railroad was created to take over a job that a couple of larger railroads didn’t want to do anymore, and has prospered since. For more information on the ACWR go here: http://www.acwr.com/ If you go into ‘CUSTOMERS’ and scroll down you will find access to a map of the present line. The map you are playing is laid out as close to this as I could get, with the businesses placed where they appear also. The idea of this map is to lay single rail, with the shortest possible branch lines to access Annexes. Passing track should only be laid at depots as needed. Bridges are expensive and there are only two types, Stone for short bridges and Deck Girder, which is very costly, for the one needed crossing of the river. The Stone are expensive, so conform to the landscape as much as possible. Tunnels are allowed, IF you want to lay out $30 Million a section! Now you can probably run this map, and most likely win, if you just make runs where you chose, but that is not the real challenge of it. One track from Charlotte to Gulf, and one from somewhere between Star and Troy down to Aberdeen, and take it from there. The other thing is to have only one of each Engine on the map at a time. Here is the list of Engines and the year they appear: 1992 — ACWR 3802 GP38-2 1994 — ACWR 3803 GP38-2 2002 — ACWR 703 GP40-2WL 2003 — ACWR 2077 GP38-2 2004 — ACWR 9556 GP40-2WL 2007 — ACWR 4500 F7A 2007 — ACWR 4501 F7A 2008 — ACWR 9529 GP40-2WL The map also contains a few new cars, a tank container, a flat car hauling steel plates, a rib-sided covered hopper and a high-sided open hopper. I’d also like to thank MrScott1964 for his four coal cars, the C&O, the DLW, the Erie and the LV. They saved me a few days work. Thanks also goes to Choobacca for his BN and BNSF covered hoppers, which I upped the detail on for this map. One last thing, one of our testers mentioned that the pointer was difficult for him to use. If this is the case for you, just go in and delete the Pointer.ani file and you’ll go back to the original pointer. To use the attached files, place all three files in the same folder and click on 001. It will create a folder called AC&W.7z which will contain the folder AC&W and the Warehouse.FPK file. Place these into your UserMaps. 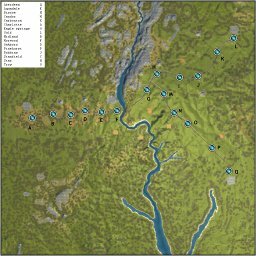 You can now play the map. You might want to do a zip of the folder first for storage for later playing. Good luck and watch for head-butting engines. As always if you find any errors, drop us a line and we’ll pull the maintenance crew out of their card game and get them right on it.